Zhi Soon has been running to visit his 86-year old running coach, Tricia, every week for the last 5 months. 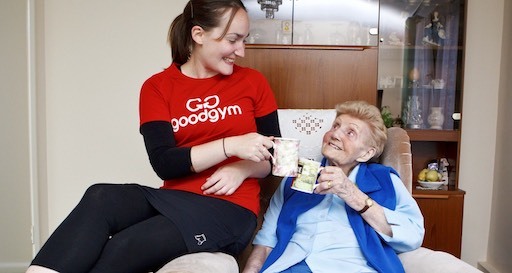 She was referred to GoodGym earlier this year by South London Cares because she struggles with feeling lonely. In recent years she’s had some trouble with her legs, so it can be difficult for her to get out and visit her friends. For Tricia, this has been particularly difficult to come to terms with - mainly because she still feels so young in herself and has always been active. She loves ballroom dancing which she used to do regularly. Tricia said: "I don’t have many visitors so I look forward to Zhi Soon’s visits very much. I love talking to people and having company - it’s something that my friends always said I used to be like." it feels like I’ve known him for years"
"Ever since his first visit we’ve always had plenty to chat about - I said that to my friend Linda. I said it feels like I’ve known him for years, sometimes when you meet people you just click don’t you?" 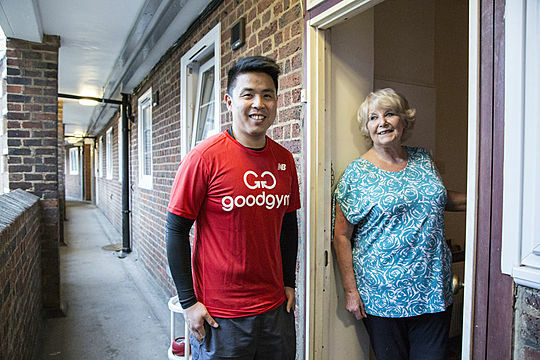 Zhi said: "I think the GoodGym team did a bit of match-making here as I love to talk and Tricia wanted someone who she could have a good conversation with." They have no shortage of things to chat about. Tricia used to work as a manager in event security and loves to share tales about what life was like for her as a young woman working in London. we chat lots about her experiences of working and living in London"
"Tricia has had a really interesting career so we chat lots about her experiences of working and living in London. Plus because I’m Australian, it’s pretty good to be able to learn more about British culture and hear all about the TV shows too!" For Zhi, living away from his family means that he misses spending time with his grandparents. Knowing that Tricia is waiting to welcome him at the end of his run every week has been a great way to reconnect with someone from a different generation and has given him the motivation he needs to stay fit. "It’s nice to spend time with someone who’s a bit older. They have a different perspective on the world - they’ve experienced different challenges and adventures to me, so they see the world a bit differently." the main thing I get out of this"
"It’s companionship isn’t it? That’s the main thing I get out of this. My friend Linda phones me every other day to see how I am, but it’s not the same as having a visit. I look forward to his visits very much."